TG: So, I just have to ask you, um, is it any less fun after like the massacre at Sandy Hook Elementary. Do you ever go through a period where you lose your taste for movie violence. I understand the difference. But still, are there times when it’s, it just is not, um, is not a fun experience for you. Either to be making it that way, or to be in the audience for something like that. One of the analogies I’ve always used is that I have no more problem with violence in movies than I do with musical sequences in Vincente Minnelli movies; it’s simply one of the things that you can do in cinema that’s interesting to watch. And I feel totally great and fine in saying that in real life I have a major problem with violence, that I do think our society is too violent, but I have no problem going to a film and seeing violence on the screen. 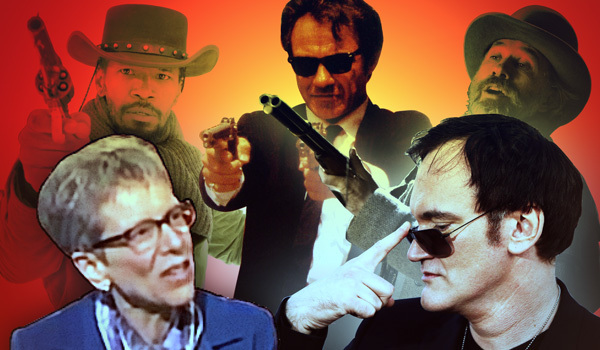 Just as Tarantino’s films have recurring motifs (pop culture references, torture scenes, lingering shots of women’s feet) so does the media coverage of them. What’s interesting about Gross’ question is that it represents an antiquated view of the violence in Tarantino’s films that most of the press has evolved past. As was the case with Jackie Brown in 1997, the media coverage for his latest film, Django Unchained has centered on the film’s use of the N-word and not the films use of violence. A partial transcript of the Fresh Air interview with Tarantino is posted below. TG: So, I just have to ask you, um, is it any less fun after like the massacre at Sandy Hook Elementary. Do you ever go through a period where you lose your taste for movie violence. And movie violence is not real violence. I understand the difference. But still, are there times when it’s, it just is not, um, is not a fun experience for you. Either to be making it that way, or to be in the audience for something like that. QT: Sadistic? I don’t know. I don’t know. I don’t know. I think you’re putting a judgement on it. TG: When I say sadistic. No, no, no. The characters are sadistic. The characters are sadistic. I’m not the talking about the filmmaker, I’m talking about the characters. I mean the character’s are undeniably sadistic. QT: Hm mm. Yeah, uh, when you say after the tragedy. What do you mean by that exactly? QT: Do you mean on that day, on that day, would I watch The Wild Bunch. Maybe not on that day. QT: Would I watch a Kung-Fu movie three days after the Sandy Hook massacre? Would I watch a Kung-Fu movie? Maybe. Cause they have nothing to do with each other. TG: I know you’ve been asked this a lot. QT: Yeah I’m really annoyed. I think it’s disrespectful. I think it’s disrespectful to their memory. QT: To the memory of the people who died to talk about movies. I think it’s totally disrespectful to their memory. Obviously the issue is gun control and mental health.